In this non-figurative window everything seems to be moving and turning around the dark red centre that is located two thirds towards the top. While the circular movement that starts at the bottom right continues in the middle of the window, the movement in the upper third is slightly directed to the left. The energy dispersed by the red kernel spirals out and scatters into countless gold-yellow parts into the endless expanse of the universe. It is an image of lavishness and extravagance. Apart from the circular movement, the outstanding features of this window are the bright red and golden yellow. The bright red may remind us of blood, which while it streams from the heart through the veins provides the human body with the ability to live. It can also be seen as the blood of Christ. Because Christ infinitely loved us, he could give his divine life for us and so deliver us from freedom robbing restrictions. Every time we celebrate the Lord’s supper this act becomes a present reality and can the love of God change our lifes existentially like a bright light shining in the darkness. This also comes to expression in the golden yellow that stands ‘for the divine omnipresence, for protection and warmth’ (Nestler). The golden elements drift into the church like a salutary rain of leafs, blessing the believers with celestial light, strengthening, fulfilling and connecting them. This play of light and colour is interspersed with white patches. Like wispy clouds they lay on top of the colour spectacle, partly concealing it, as much of the eternal light and what it entails may have become visible here, but its complete fullness can not yet be seen or experienced. A sense of melancholy remains. This multilayered message also comes out in the extraordinary construction of the window. In four layers and through the use of diverse techniques the colours and forms have been skilfully attached to the glass. In order to absorb them in all their richness, the viewer has to move about. 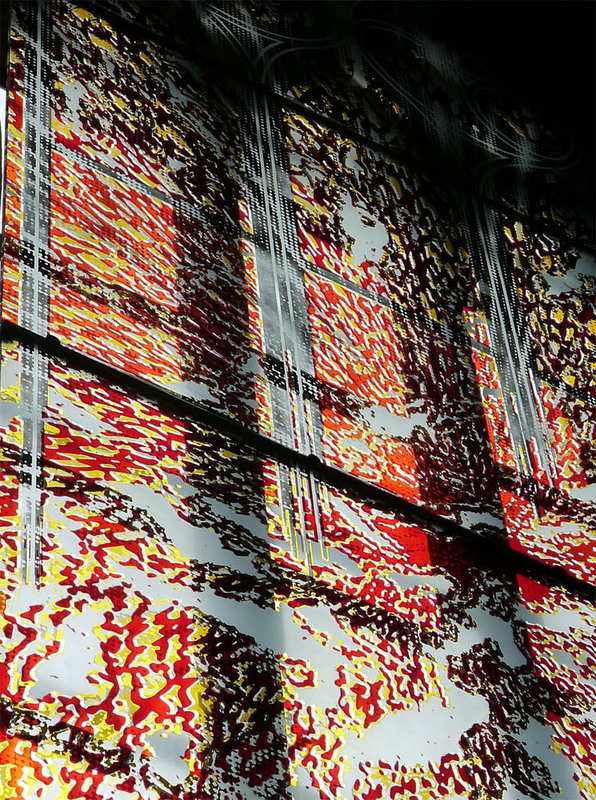 One fully experiences the impact of the coloured fragments only when one looks at the window from various angles. Another outstanding feature is that the glass has not been fitted into the window frame, but is hung as an independent surface about 30 cm from the window. While at the top the tracery of the window is repeated in the glass, the gothic architecture becomes less visible towards the bottom and is finally only perceptible as a shadow. In this way ‘the light that is limited by the architecture broadens out into a new limitless space’ (Nestler) and the perceptible light continues as incomprehensible divine light in the believer. Bernd Nestler is a German artist who studied art history at the University of Regensburg and graphic art and painting at theAcademy of Fine Arts in Munich. Nestler has developed his own formal and visual language merging figuration, abstraction, transparency and opacity with precise line structures and surfaces. Many of his works deal with religious topics, such as his icons, which he reinterprets with modern techniques. In addition the artist focuses on profane subjects, thereby taking a wander through art history and exploring images by Dürer, Manet and others through means of glass painting. As early as the 1980s Nestler participated in the development and production of 16 windows for the Cathedral of Regensburg. Numerous public and private commissioned works and Art-in-Architecture projects followed. In 2006 the artist presented a mirror installation at the AsamChurch, Munich. 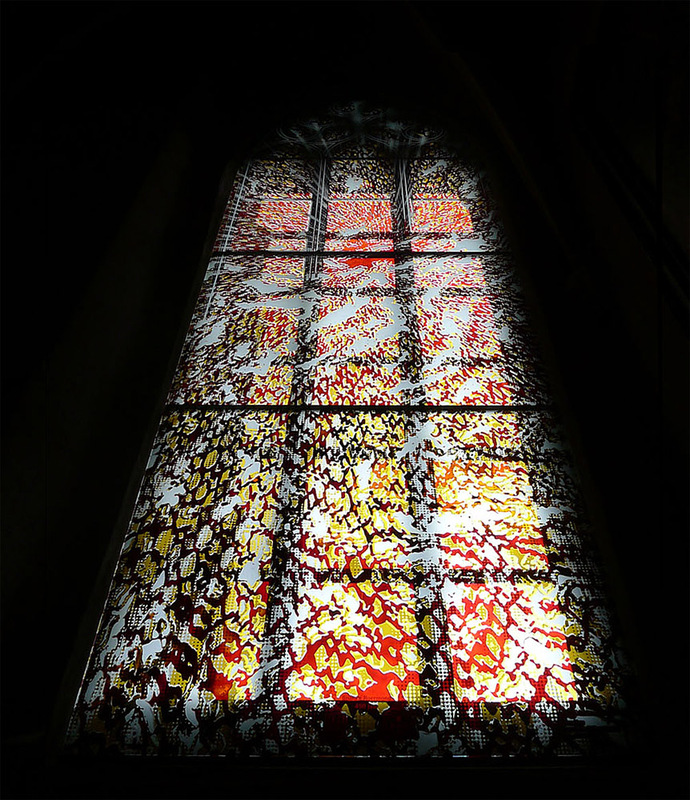 In 2011 he won a European competition to design a window at St. Christopher Cathedral in Roermond, the Netherlands. Patrik Scherrer is the driving force behind the German website Bildimpuls. Every fortnight he sends out a ‘Bildimpuls’ or visual meditation, in which he focuses on contemporary Christian and religious art from Germany, Switzerland and Austria. He studied theology and works with the mentally handicapped. He wrote the book Gott in Sicht? 33 Impulse zum christlichen Glauben aus der Pinakothek der Moderne, Schnell & Steiner, 2005. On the Bildimpuls website there is also a lot of information about artists, books, museums, exhibitions and organizations in Germany, see www.bildimpuls.de.